Well, I am finally sitting down to write another post in my adoption series! What a long time it's been! Would you like a quick recap? I was adopted at birth and last year began the process of tracking down my birth-mother (for privacy, I refer to her as B - for Birth-mother), and you followed along my journey as I sent off the first letter and received the first reply! It was incredible. Well, since receiving B's first letter in August last year (wow, so long ago? ), I have written back and she has written back again. Let me tell you, it is SO AWESOME to be in touch with her!! At first it was just so surreal to finally be corresponding with this wonderful lady that had only ever been a concept in my head - to actually have a real person at the other end was so strange! Since exchanging a few letters back and forth it's been really nice. Wonderful to 'hear' her voice and get an idea of what she is like as a real person, and not the imaginary one that's always lived in my head. We haven't met yet because B lives in a different country. So for now I have to be patient - if we had the money I would jump on an aeroplane tomorrow! I've said before how I'm so excited to meet her - and that was before we'd exchanged letters - and I'm looking forward to it even more now! In my head, the scene I see as we meet again is amazing. Can't wait for that looooooong hug that I know will come. Alas, unless we win Lotto (highly unlikely, as we don't buy tickets), that meeting won't be until the end of next year sometime. Patience, my pretty. I'm in the process of writing my next letter to B - I started it about 2 weeks ago! I must finish it and send it off today, as I just got another letter from her in my letterbox this morning! Oopsie! I'm taking a bit to long to reply... It's been a busy few months: since I last wrote, we've found out we are expecting No. 4, Rosie started Montessori kindy, Elliot started school, we started renovating the house and Hayden had his accident - an eventful 6 months! In the next few weeks (once my letter arrives at B's house) we will be setting up a phone call. Exciting and nerve-wracking - I get nervous talking on the phone!! But like she said in her letter today - one we start talking we'll probably never stop! I love it. Also, interesting fact: today's letter included photos (YAY!!) and now I know who Tristan looks like! Amazing! He's always looked quite different to the others, a bit like me, not much like Hayden, but I see now lots like B! As I looked at the photo of her at 3.5 years old, I thought, "Tristan!" SO DARN COOL! Growing up, family resemblance was always something that I really missed: surrounded by a beautiful extended family who all shared the same genetics and family traits, no-one looked like me (or my sister). I have loved having my own family and seeing our children turn out to look like me and Hayden, and now I love love LOVE knowing that they also have resemblance to B. So that's where I'm at! So happy to be in a good relationship with B; that my worst fear of being turned away by her never came true. In fact it was the opposite - she's glad I contacted her! It's wonderful to have been able to open up this side of myself that had, from necessity, remained a closed book. It's great to be able to fill out the blanks. Check out the Adoption & Me tab at the top of my page (under the blog header) for the rest of the posts in this series. We are making progress. Some fast, some slow, but both steady. Our renovations are coming along. To be honest, when we started, I hadn't realised just how big a project it would become. Naive little me. Currently, we have a bathroom that is now about 60% finished, I think. We have a new bath installed, walls have been re-Gib'd (how do you write that? ), bath/shower has been lined with ACP shower-liner, new plumbing has all been installed and the Gib-stopping is just about finished. Our lovely plasterer Phil will be finishing with the sanding tonight or tomorrow morning and then we will be ready to paint it. After that, we still have to slightly adjust the vanity, get new vinyl laid on the floor and put up the towel rails. It looks pretty different in there now! 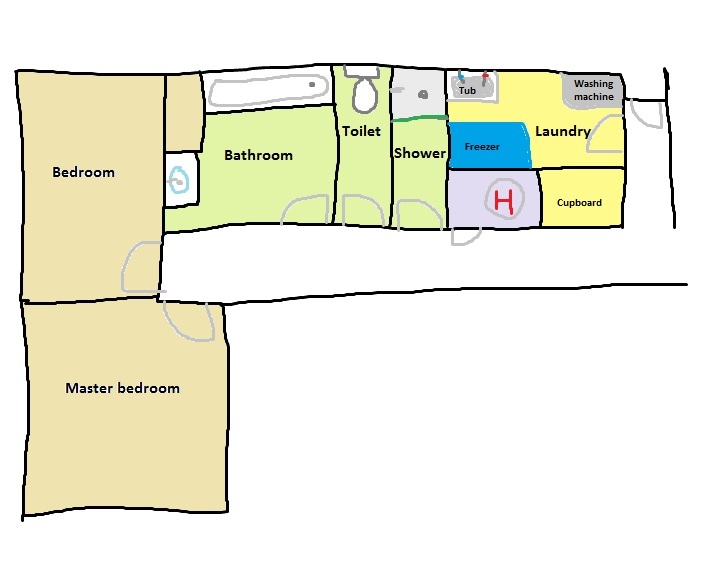 Here's the house plans again, for your refreshment. (Remember the hand-drawn one is totally out of scale.) We have done the bathroom, are keeping the toilet, existing shower is still connected until we're ready to use the new one, the new wall will go up for the laundry/mudroom space and the new room (Baby's!) will be done last. We've taken out the hot water cupboard, laundry cupboard and wall that separated the laundry from the short hallway, so we currently have an enormous laundry! It's quite nice to walk into such a big space! Last week Hayden and his Dad put up the new laundry door, so now instead of a short hallway, we have just a door. It's actually made a really big difference in heating the house - we hadn't realised how much heat got lost out to the external (glass) door! 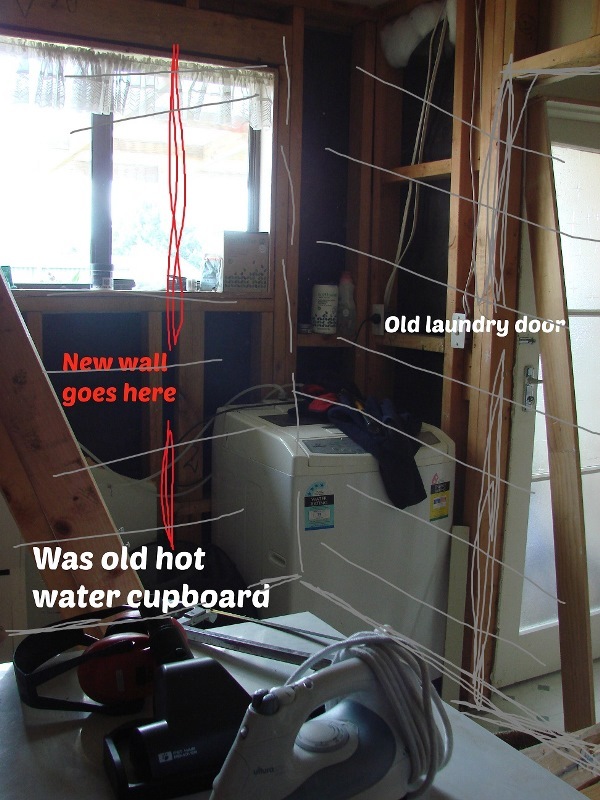 We've hit a slight snag in that the wall between the current shower and laundry - which falls bang-smack in the middle of the intended new room - is a braced wall. This means we need some expert input to see if we can brace the new walls instead or if the structure of the house needs the brace to be right where it is... 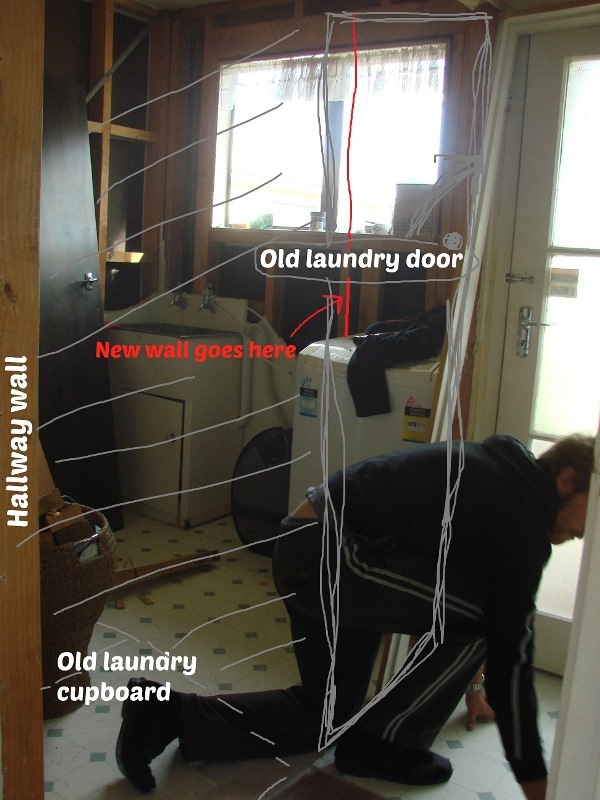 This was unexpected because we thought the only load-bearing/structural walls were the ones running down the hallway. And now for a quick update (this post is long enough!) on the Progress of the Head kind. Hayden is doing pretty good. He is now working with an Occupational Therapist and last week we saw a Neurologist, both of whom have been really good in helping us to understand where we're at. The neurologist expressed surprise at an actual bruise on Hayden's brain, indicating just how severe the blow to his head was. However, he 'passed' a lot of the little tests, so he's making good progress. One tricky little reflex test shows that his brain still has the injury, so we're not clear yet. He said typically, a concussed person will make most of their recovery (80-90%?) in the first 3 months, and then over the next 1-3 years will make the rest of the recovery. Hayden has now gone part time at school, teaching only his 2 senior Chemistry classes, which is really great and means he can rest a bit more. This will be in place until then end of the term, after which we'll review. In the mean time, Hayden occasionally has a headache - though not as often as I expected - and still struggles to cope with too much noise or interaction - like two students asking him questions at the same time. He also is dealing with fatigue.